In the last article we saw that in 433, one year after his arrival to Ireland, St. Patrick defied the Druid law and lit the Easter fire. After his three victories on the Hill of Slane, the Saint was summoned to the presence of the King of Tara. With the help of Heaven, he and his company of eight avoided the soldiers sent to slay them. Thus, on Sunday, St. Patrick arrived at Tara and appeared before the astonished King. The pagans had resumed their festivities. 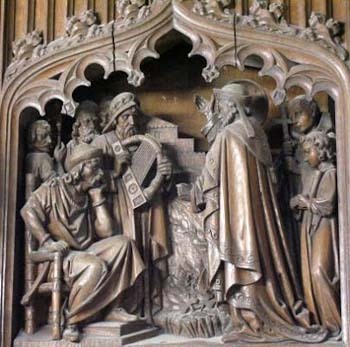 King Laeghaire with his court was at table, probably seeking to drown the terrible recollections of the previous day, when the man of God appeared amongst them. The scene of the day before was repeated. The King of Tara remained seated, and all the royal party followed his lead, except two, who rose to honor the Saint. These were Dubhtach, the royal poet, and a youth named Fiacc, also a poet. The name of the latter, as saint and poet, has become familiar in the Irish Church. He became the chief bishop of Leinster and wrote the metrical life of St. Patrick in Irish. The circumstance that they rose to meet St. Patrick is specially recorded, as to remain seated seems to have been, in the customs of the country, the form of protest against an unwelcome guest. Patrick was then invited to eat and was offered a goblet of poisoned ale. The Saint blessed the goblet, and turning it over, the poison alone fell out in the sight of all. When the party had arisen from table they adjourned to a plain outside Tara, and a great multitude went with them. Here the Druid Luchat Mael challenged the Saint to work wonders before the multitude. In the contest which followed, God allowed the magician to exercise strange and preternatural powers, which turned in the end to his own confusion. By his spells and incantations he brought snow upon the ground up to the men’s girdles and involved the whole plain in darkness, but he could neither remove the snow nor dispel the darkness, both of which disappeared at the prayer of Patrick. The King proposed that they should both throw their books into the water, and that whosesoever books came out dry should be declared worthy of adoration. Patrick consented, but the Druid refused, saying that the waters were Patrick’s god, for he had heard that it was through water that the Saint baptized. At this the King urged them again to try their books by fire, but the magician again objected, and said that this Christian, in alternate years, venerated either a god of fire or one of water. The Saint at first had shown an unwillingness to seem to anticipate the designs of God by demanding miracles, saying, “I do not wish to go against the will of God.” But now he was inspired to make a proposal, which reveals at the same time the boldness of his own faith and the power which he had of imparting it to others. He told his opponents that he adored, not any of the elements, but the Maker of all; and, as an evidence that his God was the ruler of these elements, he made a proposal which nothing but a special inspiration could justify. He challenged them to raise a temporary structure, of which one-half should be composed of dry faggots and the other of green wood. Amidst the dry wood the boy Benignus, whom he loved, wearing the Druid’s tunic, would place himself, if the Druid, invested with the Saint’s casula, would consent to bury himself amongst the green wood. Then the structure should be set on fire, leaving it to God to defend His own. The faith of Benignus was equal to the emergency, and the Druid at once accepted an ordeal in which all the chances were on his side. And when the pagan priest and the Christian boy had entered the house, the door was fastened on the outside, and fire set. 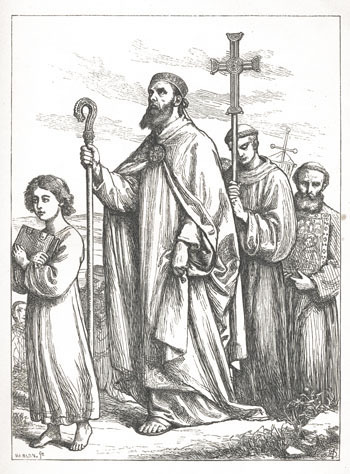 As Patrick prayed, he guided the fierce element, which consumed the Druid and the wet green wood around him, leaving the casula of the Saint untouched, while it passed through the dry wood and, surrounding Benignus, only burned the Druid’s tunic that he wore. When the Christian boy came forth unhurt from the fire while the smoke of the magician’s torments ascended to heaven, it seemed as if the cause was finished. But it was not so. For King Laeghaire, irritated rather than humbled, like a wild beast, seems to have lost his reason in his rage. So then King Laeghaire knelt before Patrick and believed in God, but he did not believe with a pure heart. And on that day many thousands believed. Thus was the first great conversion of the pagan court on Tara Hill in the year 433. From this time on, the waves of the new Catholic Faith and Civilization spread, until they had engulfed the whole island and paganism faded gradually away into the dim realms of traditional lore.